SALEM, Mass. – Last year the Torch Club, a group of 10-12 year-olds at the Boys and Girls Club of Greater Salem, learnted about Haitian art, Guatemalan textiles and Japanese Manga in an art culture course. 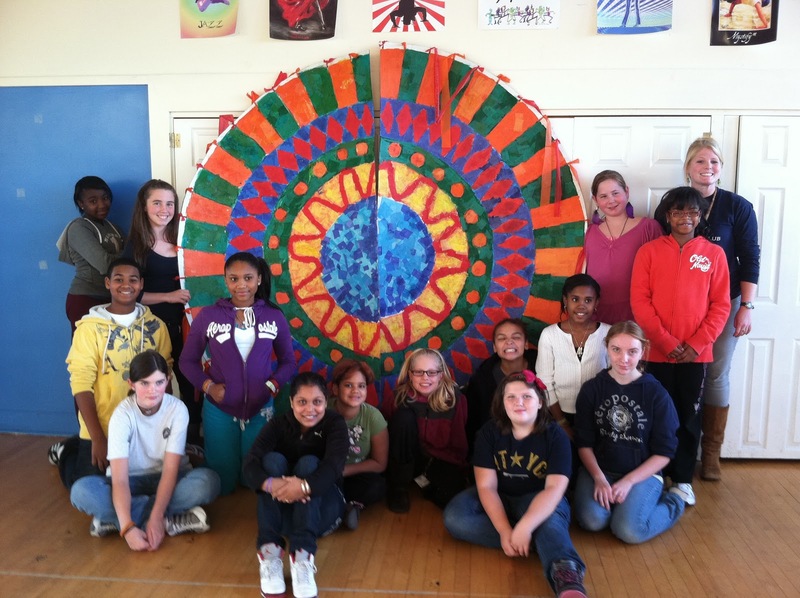 This fall their most recent project has been to make a large, Guatemalan-style kite to benefit ArtCorps, a nonprofit group based in Ipswich, Mass, which uses art for community development in Central America. “We took two weeks off to make this kite,” said Taylor Nelson, 24, director of art and education at the Boys and Girls Club. Nelson began and oversees the art culture course with the Torch Club and has been helping them build the seven-by-seven foot kite. “My kids have cut hundreds of kite tails,” she said. The kite and its tails will be used on Thursday, November 4, as part of the ArtCorps’ annual benefit, “Raising Spirits: An Evening of Art and Stories.” The event begins at 6 p.m. and will be hosted by Cell Signalling Technology of Danvers in their Jungle Atrium, a large green house filled with plants. Inspired by a Guatemalan ceremony, Dia de los Muertos (Day of the Dead) at which people remember those who have touched their lives, the unique benefit invites guests to tell the story of such a person in their life and attach that person’s name to the kite tail. The event includes a silent auction, live Latin Jazz music, and wine and beer provided by Ipswich Ale. ArtCorps will also be presenting the 2011 Creative Activist Award, an award given to two artists, one local and one who has worked in Central America. “This award is to show that there are people using art for social change right here and around the world,” said Marta Oslin, 34, program director at ArtCorps. With a background in international development, Oslin has been with ArtCorps for three years as one of six full-time workers. She and three others work in the office space provided by the New England BioLabs (NEB), a laboratory in Ipswich that produces and supplies reagents (substances used for chemical analyses) for the life science industry. ArtCorps kind of grew out of several projects that we had down in Guatemala,” said Dave Comb, creative director at Cell Signalling Technology and a board member of NEB. Comb said that since 1999, ArtCorps has grown from a nonprofit to an independent group still funded by NEB. “The Jungle Atrium (at Cell Signalling Technology) goes with the theme of working in warmer climates,” said Oslin. ArtCorps sends artists to partner organizations in Guatemala, El Salvador and Honduras for a minimum of one year’s residency. Each artist works with a local expert in his or her particular field to inspire, educate and organize individuals and communities. Some of the artists’ work includes creating theatrical plays on gender violence with youth in El Salvador, creative workshops for radio broadcasters, helping teach marketable skills like jewelry and bread-making, or designing curriculum on environmental conservation with teachers in Guatemala. Interested in this kind of work, Nelson applied for a job at ArtCorps in 2009 after graduating from college. When she was turned down, she decided instead to volunteer with them, using her position at Salem Boys and Girls Club to gain more community art experience. Nelson is now helping with the events and marketing committee for the upcoming fundraiser and will be managing the kite-tail and storytelling part of the evening. The event is only for ages 21 and older but the children and staff who worked on the kite have written the name and story of an inspirational person in their lives to attach to the kite tail. Nelson wanted the kite-making project to encourage the children in the Torch Club to think more about social justice. Urgent Thesis Writing doesn't generally make a difference what you are expounding on in your article; what truly matters is that your written work shows trust, stands out just enough to be noticed, keeps that consideration, and gets them to act. Packers and Movers Ahmedabad is a standout amongst the most popular site for packing and moving administrations. We are tried and true on what we say and solid and reliable in our work for as we are online; this is the real thing we have to remember to secure our customer's trust. Would you have an Instagram account for your personal small business? Trying to find a easy method to raise its believability and visibility? Then you really need to think about buying Instagram Likes. 12000 likes High quality Instagram likes contain the probable to boost traffic to your profile and cause you to well known within a quick period of time. You may as well take into consideration obtaining a boost in your new Instagram profile by getting Instagram likes. Dripex.com is one of the very first corporations to offer 100% real, real human and reliable Instagram followers. We never ever use any variety bot or script which give bogus followers. We do promote your account manually and mail you followers. buy instagram followers fastThe followers will continue to keep update along with you and set remarks and likes for your exciting pictures. We assure them to be 100% natural and handy. Our top rated superiority is always to get you highest feasible ROI. as an ideology still remains strong, to which the neo-imperialist ideology of the Clash of Civilisations / "humanitarian intervention" is firmly attached. happy new year 2016 imagesas an ideology still remains strong, to which the neo-imperialist ideology of the Clash of Civilisations / "humanitarian intervention" is firmly attached. happy new year 2016 wallpapersas an ideology still remains strong, to which the neo-imperialist ideology of the Clash of Civilisations / "humanitarian intervention" is firmly attached. happy new year 2016as an ideology still remains strong, to which the neo-imperialist ideology of the Clash of Civilisations / "humanitarian intervention" is firmly attached. new year 2016 imagesas an ideology still remains strong, to which the neo-imperialist ideology of the Clash of Civilisations / "humanitarian intervention" is firmly attached. new year 2016 wallpapersas an ideology still remains strong, to which the neo-imperialist ideology of the Clash of Civilisations / "humanitarian intervention" is firmly attached. Thank You. Enjoy new year with great messages. New Year is one of the best festivities of the year. This event is treated specially by people across all the cross-sections of life. happy new year wallpapers for facebook Many cultures celebrate the event in some manner. If you're liking the construction of the brand new Nike Air Force 1 Ultra Flyknit but are looking for something a bit on the subtle side, nike air max shoes this all-black colorway of the new model is nike air max 2016 for you. As mentioned above, the Air Jordan 1 KO Shadow will come in a canvas upper done up in a predominantly black colorway. Grey is placed on the ankle collar (leather), while the Nike Swoosh and stephen curry shoes toebox come in grey canvas. Offsetting the two-toned upper is the white midsole paired up with the black michael jordan air jordan 1 outsole. Grey Nike branding appears on the black nylon tongue, while the Wings logo in the ankle says cheap air max "AJKO". Rounding out the look of the shoe is the black laces that tie up the entire look new balance 572 together. The Air Jordan 5 Low Alternate 90 is expected to arrive next month, which is part of new balance kids JB's legacy shoe capsule that continues to celebrate the brand's 30th anniversary. With this variation of the silhouette nike air max ltd inspired by player exclusive iterations, the model is essentially executed in the Chicago Bulls' signature tones of Red steph curry birthday shoes and Black. This particular pair gives a hint at what MJ would have worn during that era. Comprised black nike huarache of smooth nubuck for its upper, tonal synthetic elements are evident with the signature netting across its side nike huarache shoes panels. A reflective tongue, translucent lace lock, red accents on the outsole and distinctive jagged component on the air jordan wholesale midsole consists as other notable elements. nicw article. i like it. you can see more pictures and cards here. Thank you so much for this post, I have also posts about home improvementm, First is Interesting Facts about Driftwood Mirror and second is Decorate Your Home with Driftwood Mirrors?